We are interested in how a single dose of the blood pressure medicine losartan affects accuracy and reaction time in simple computer tasks. Recent studies suggest that this medication might have the potential to improve psychological treatments, and we hope that the knowledge gained from this study will eventually contribute to the improvement of treatment for people who experience emotional problems such as anxiety disorders. We would like to test two groups of people: one who receives a single dose of losartan, and one who receives placebo (a substance not containing any medication). Your allocation to one of these groups will be randomised. You will be asked to come to see us on two occasions. Your first visit will be a screening session where we will make sure that it is safe for you to take part, and that you are suitable for this particular study. We will also give you the chance to ask any questions you might have. This session will involve asking you to: sign a consent form, give us some information about your medical history and complete a routine medical examination answer some detailed questions about your current and previous psychological well-being, complete a series of questionnaires asking about symptoms such as anxiety or low mood. The screening visit will take about 0.5 to 1 hour. We will ask you to have your last meal two hours before this visit. At the beginning of your visit, you will receive a capsule that will either be a placebo capsule (not containing any medication) or a 50mg losartan capsule. 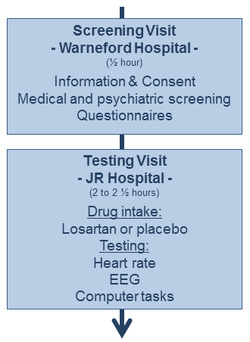 Which one of these treatments you will receive will be randomised, and until the end of your study participation, neither you nor the experimenter will be aware which treatment you have received. Losartan has been tested in similar studies before, and it has been shown that single-doses like the one you might be receiving are unlikely to cause any side effects. One hour after having taken the capsule, during which we will attach the electroencephalography (EEG) cap, you will be participating in a testing session lasting about 1 hour. During this time, we will measure your speed and accuracy in simple reaction tasks on the computer, including responding to photographs of faces with different expressions. The total time of your visit at the John Radcliffe Hospital is approximately 2 to 2 1/2 hours. It is essential that you can keep the appointment arranged for you as lab time is highly sought after and cancellations must be made as soon as possible so that other researchers can use the time. You will be reimbursed £30 in cash for your time and travel. Losartan is a medication for high blood pressure which has had UK market authorisation for 20 years. Recent research suggests that this drug can also improve cognition and the effects of learning experiences. As a side effect, some participants experience symptoms such as drowsiness, muscle weakness, low blood sugar, headaches, hypotension or allergic reactions. However, if you are randomised to the losartan condition you will only be asked to take a very low, single dose. Recent studies have shown that taking such doses is very unlikely to cause side effects. If you nevertheless experience once of these severe side effects, you will be withdrawn from the study. Please get in touch if you would like to take part in this study, and do not hesitate to also let us know if you have any questions or worries about your participation.